Last edited by SurfGuruJeff; 10-15-2016 at 02:24 PM. Hahaha. Yeah. Borrowed pic from Moore Performance. and if anyone wants to buy just a pig tail, i believe you can get one pre wired from moto-east. worth it to note this will only work with a protuner. Im pretty sure ATR does not have custom sensor logging enabled. So connect white aem 0-5v to o2 sensor side of pigtail. What about the blue serial output aem wire, not needed? 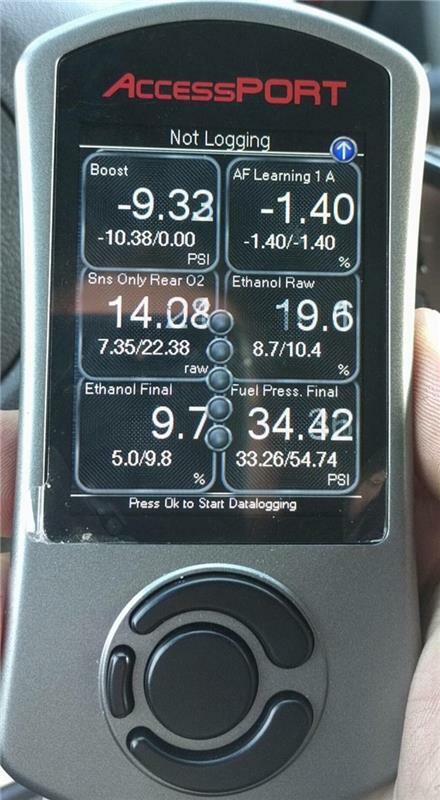 Most importantly, can you hook up egt, oil temp, diff temp, and oil pressure in a similar way? Correct, the blue serial wire is not needed. How about Onboard realtime map switching? This is what I plan on doing with my WMI. nice. I was testing it all out-in boost on the meth maps, trigger the fail safe, it's instant switch over to my pump maps-looking at data logs the boost drops right down from my meth level to pump level & it's really smooth. No need to let off the throttle, just keep on keeping on. The thing that has me most excited is now having two timing/boost maps. This is huge-finally I can run nitrous without a stand alone ecu. That's what's prevented me on this car. I'm just waiting on a built block to put it all together. Had it all on my last turbo car & I miss it dearly, it's a great void in my life. sick. I guess you just used the same wiring as the flex fuel install but with the meth signals instead? Yeah, left or right tgv input, 5v or 0v to switch. I tied in at the ecu wiring harness. It's all in the aquamist thread around page 75 maybe? Seems like this could be used for the torque app too unless I'm missing something. Should work for most years, but you'll have to find the correct color wire (it is different) for your '05 to tap into. Looked today. Plug and wires are same for 02 WRX. Wish these features were available in ATR. But I may hook up a redundant pigtail so I can keep it hooked up to the OEM harness for now and easily switch to the second pigtail with the UEGO input next time I do more with my e-tuner. I believe the new ATR does have custom sensor logging enabled. Hmmm, checked my ATR for updates and found none. Is this a new version thats needs a separate download? yes the newest version that requires a class. Ah I guess that'd be why. Thanks. Just another note to anyone installing a AEM X-Series Wideband UEGO with the Bosch LSU 4.9 sensor, you also need to ground the BROWN wire for analog sensor ground. Otherwise it wont output 0-5v to the ecu. Thanks for that. I'll update first post. Just did this in my 07 STi, worked like a charm I don't have the new fancy version of ATR so I just log the AFsensor 3 voltage and convert it in excel. does this affect to way the rear O2 functions? If hooking up to TGV wire i take it they have to be deleted? I'm thinking you would be able to log wideband with btSsm. Last edited by my9999; 11-01-2016 at 01:56 AM.